Delicious culinary creations and ingenuity earned the USVI Culinary Team silver overall at the 2017 Taste of the Caribbean competition held June 2-6 in Miami, Florida. Team members also brought home medals in several individual categories. Additional medals include silver for Chef of the Year Tatiana Connor-Peets, Pastry Chef of the Year Natalie Buckner, Bartender of the Year Christopher Bahash, Norman McPherson in the Seafood Competition and Shawn Riley in the Beef Competition. A bronze medal went to Natalie Buckner in the Chocolate Competition. Honorable mention was awarded to Junior Chef of the Year Nandi Furet. A special congratulations to our very own Pastry Chef Natalie Buckner who joined the USVI Culinary Team and represented Caneel Bay Resort in the competition. The Taste of the Caribbean event has been hosted annually by CHTA since 1993. 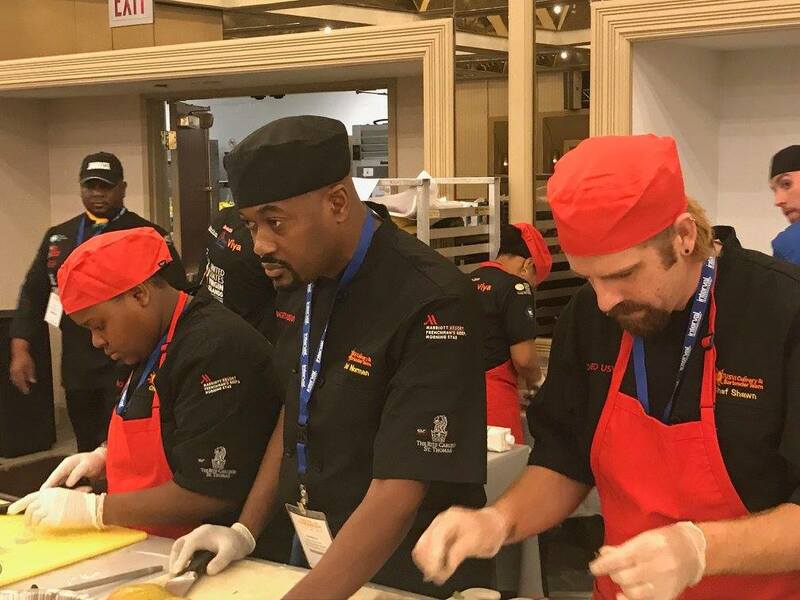 Chefs and culinary teams from all over the region participate in team and individual competitions which allow them to demonstrate their culinary skills and share the flavor of their Caribbean homes. The 2017 edition of Taste of the Caribbean also brought educational sessions for food and beverage professionals. USVI Culinary Team members include team managers Executive Chef Michael Grau from The Ritz-Carlton, St. Thomas and Chef Kilian Werner from Frenchman’s Reef & Morning Star Marriott Beach Resort, Chef Shawn Riley from Sand Castle on the Beach, Chef Tatiana Connor-Peets from Frenchman’s Reef & Morning Star Marriott Beach Resort, Pastry Chef Natalie Buckner from Caneel Bay, Chef Norman McPherson from The Ritz-Carlton, St. Thomas, Bartender Chris Bahash from The Tap & Still and Junior Chef Nandi Furet from Ivanna Eudora Kean High School. USVIHTA would like to thank our team sponsors the USVI Department of Tourism; the West Indian Company Limited; Diageo USVI; International Capital & Management Company; Viya; Merchants Market; The Ritz-Carlton, St. Thomas; Frenchman’s Reef & Morning Star Marriott Beach Resort; Taste of St. Croix; and KLR Services, LLC. Recap courtesy of the USVIHTA July Newsletter. About Caneel Bay Resort: Set on a 170-acre peninsula amid the lush beauty of the Virgin Islands National Park and seven picturesque beaches, Caneel Bay is one of the most breathtaking vacation destinations in the Caribbean. Discovered by Laurance Rockefeller while sailing on a family cruise, this luxury hideaway is accessible only by boat or ferry and its beaches are widely considered to be among the best in the world. Learn more about Caneel Bay here. © 2019, Caneel Bay. All Rights Reserved.